For the past several years, the New England Aquarium has participated in a joint expedition to Fiji, along with the Monterey Bay Aquarium and other conservation-minded groups and individuals. The last expedition took place in Spring 2012. 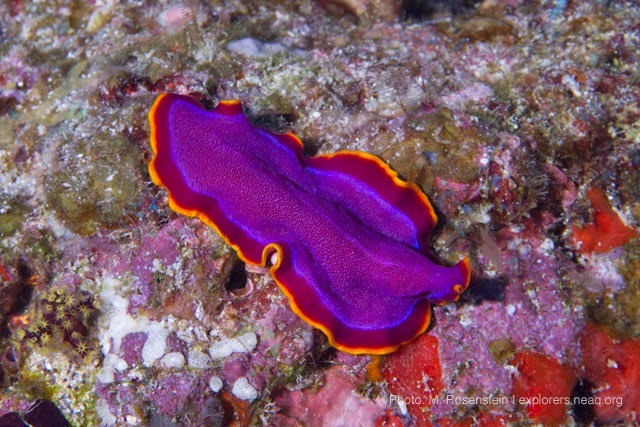 Today's post and pictures about the first dives of the joint Fiji's expedition comes from the Aquarium member Mark Rosenstein. This afternoon—Day 2—dove on a site that the Nai'a had not visited in several years. It was new to all of us and most of the crew, Rob Barrel (managing director and owner of the Nai'a) being the only one who had been on it before. Nai'a Fly'a is a drift dive, an E ticket ride down a channel on a fast incoming current. Then when you reach the right point, you turn a corner out of the current into a coral garden. Our detailed briefing talked about dealing with the fast current, and advice to head down near the bottom of the 120 foot deep channel for a little while to see the huge sea whips there. When we headed out in the skiffs, only two people opted out of the drift part of the dive, to start immediately on the shallower and calmer coral garden instead. So we all dropped into the water, and made our way quickly down to discover that there was some current, but it wasn't nearly as fast as we expected. I did make my way all the way down to the sandy bottom of the channel at 120 feet. This is rather deep for a recreational dive, and I was feeling a little ‘narcked,’ drunk on too much nitrogen. As soon as I got near the bottom, I noticed several pairs of tilefish (Family Malacanthidae) on the sand that I did not recognize. Quickly getting my camera turned on and set, I managed to get a couple of shots of these fish before they disappeared into their burrows. And a minute later, Bailey swims up to me and shows me a slate saying "TILE FISH" as he points excitedly down into the center of the channel. I give him the OK sign back, acknowledging his comment and that I've seen and photographed them. Of course, then I start doubting myself, since I'm feeling the effects of nitrogen narcosis, and already spent a couple of minutes now at this depth. But I don't want to go back out to the middle of the channel to take more pictures, so I hope for the best. The rest of the dive goes well. We drift at a reasonable speed down the channel, gradually working our way shallower. Some dogtooth tuna (Gymnosarda unicolor) swim by, as well as many reef fishes on the wall and passing pinnacles. I see a damselfish I don't recognize and get a photograph, later identifying it as Weber's chromis (Chromis weberi), a life fish for me. 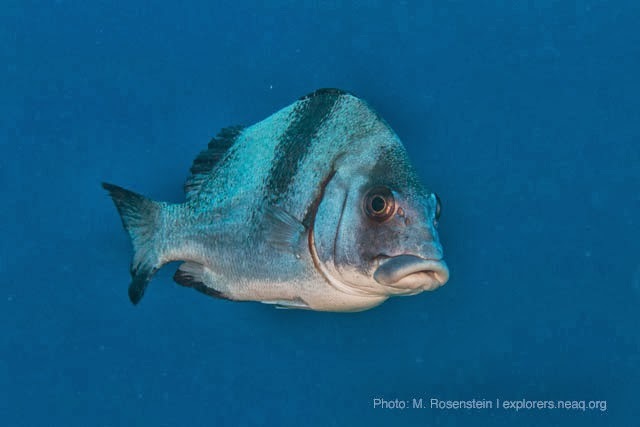 Later in the dive I see a large silvery fish that is vaguely familiar, later identifying it as a Blubberlip (Plectorhinchus gibbosus), a member of the sweetlips (Family Haemulidae). We see other sweetlips regularly, but this one is new to me. On surfacing at the end of the dive, both Bailey and I are asking about the tilefish, which was new to both of us. Only after getting back to the Nai'a and out of our wetsuits am I able to start downloading pictures from my camera to my laptop and see what I got. And I did get a decent picture of the tilefish, and it's not one that I recognize. On a first pass through our regular field guide, I don't think it is in the book, though on a second more thorough reading, I realize it is there. We've seen a pale tilefish (Hoplolatilus cuniculus), a new fish for both of us. 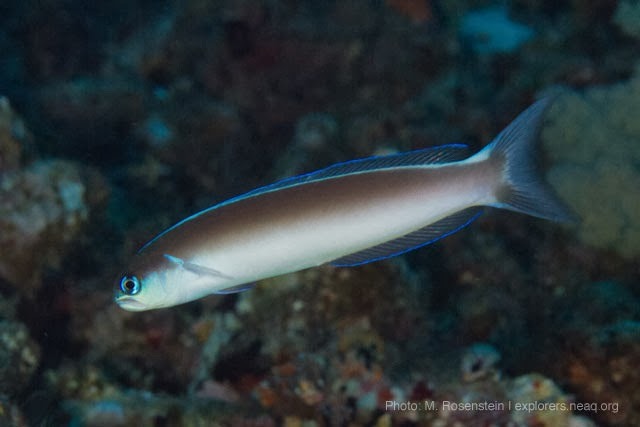 The field guide lists this part of the Pacific ocean as a place that it can be found, and it is on the list of fishes that reef fish specialist Gerry Allen has put together that he has seen in Fiji. Wow. Three new fish for me in one day. Truly a good day’s work! Stay tuned to this blog to follow the team as they dive to collect data on the health of the coral reefs, pick up trash where they find it, check in with the villagers to see how some conservation initiatives are faring and further develop connections with the people that live on these beautiful Pacific islands.